I've yet to blog about it, mostly because I've not felt well enough, but I hope to in the coming days. Right now, I am feeling somewhat better. I've had one notable improvement to speak of, otherwise; it truly is a day by day, if not at times a moment by moment, process. I'm focusing everyday on doing whatever it takes to help aid my body in recovering from this relapse. I thought along the way I would blog as my energy allows. Perhaps this will be both informative for others and therapeutic for me. This is, and has been, a most arduous and frustrating time but I'm trying to look for the silver lining in it. Honestly, I could have cared less about any silver lining when I was feeling my worst - so deeply sick and fatigued - but little by little; one day at a time. I started this blog to focus more on Lyme Disease and related health issues. Ironically, it seems to have gone in a direction I never foresaw coming but I don't want to let it go to waste. I want to document what I'm doing. 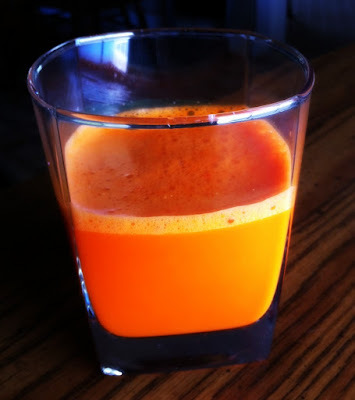 So today, I juiced some fresh organic carrots. That's one of my big accomplishments for the day. When you're chronically ill, it's the little things. I've been a juicer for awhile but it's taken a backseat to everything else lately. You know; triage what's most pressing, like surviving. One issue that's more problematic right now is my body being too acidic. Fresh vegetable and fruit juices are very alkaline and this is one of the things I'm doing to help. Drinking fresh squeezed lemon water and hot green tea with lemon is also very alkalizing. My diet has always been healthy, but I've been tweaking my food choices to promote more alkalinity as well. FYI - check out The Alkaline Sisters for some great info and recipes. I'll write more another time. OH CANADA - CALL TO ACTION! What's Happening in the Lyme World Lately? Lyme disease: Epidemic. Disabling. Expensive. Copyright 2010-2017 © My Lyme Symphony - Michelle Holderman. All Rights Reserved. Copyright © 2010-2013 Michelle Holderman. Powered by Blogger.